At Sheens Lettings & Management we offer a comprehensive service for Landlords and Tenants for a range of services across the Tendring area. Our aim is to find a quality tenant for your property that meets your criteria. Our strict credit check and referencing services enable us to ensure you of the highest standard of tenant possible. The marketing of your property is of utmost importance in order to achieve our mutual goal of an early let, at the best possible price. Through a network of publications we can ensure that your property is exposed with eye catching adverts to huge numbers of potential tenants. We advertise all of our properties in colour in the Clacton & Frinton Gazette, online via the leading property website rightmove.co.uk and in our offices in Meredith Road, Clacton-on-Sea and Connaught Avenue, Frinton-on-Sea. We offer Full Management, rent collection and introductory packages to suit all of your lettings requirements. We are full members of ARLA (Association Of Residential Letting Agents) and TPO (The Property Ombudsman) who ensure we provide you a professional service at all times keeping in mind the ever changing legislation which we need to make sure you as a landlord abide to. Social Media Coverage on Facebook & Twitter. 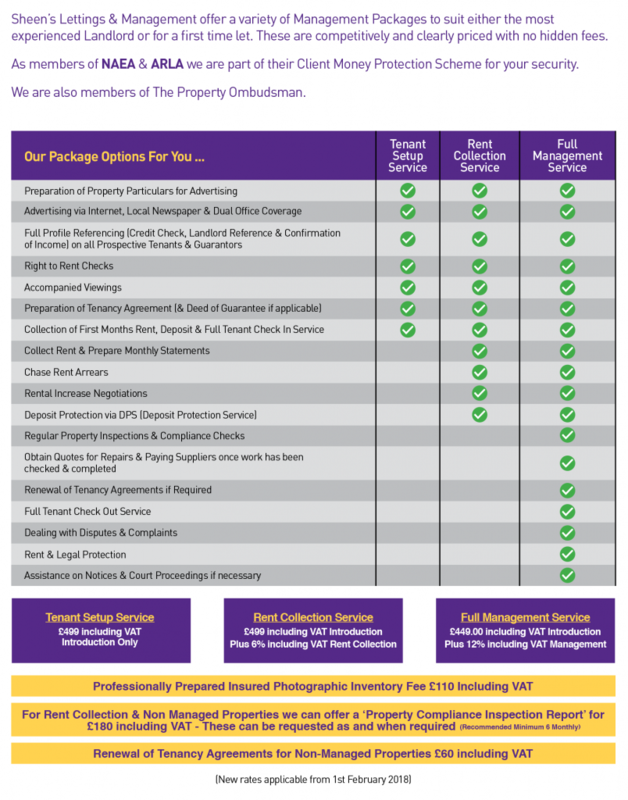 Our highly trained property management team will help you select one of our unique packages, which we have created from years of experience within the local market. We pride ourselves on our exceptional customer service, reliability and attention to detail. Our fully managed option is there for those landlords who want us to take charge of the entire rental process. All dealings with the tenant will be solely Sheen’s responsibility. We will deal with the collection and payment of rent. Any maintenance issues which arise will be reported to us and duly dealt with according to your instructions to us. We will carry out regular checks on the property and report back to you. With this option we also include free rent and legal protection (terms apply). This package is designed to make your investment run as smoothly as possible with the minimal amount of input from yourself leaving the whole rental process to our dedicated team. The Rent Collection Package is aimed at those landlords who wish for us to deal with all sides of collecting the rent and also chasing unpaid rent should this occur. We will also provide statements of the funds which have been received and transferred to yourself as the landlord. These statements will help provide the necessary information for your tax returns on rent you have received. This package is suitable for Landlords who are happy to deal with the maintenance side themselves where the tenant will have contact to report any issues which arise. This package will include all advertising to find you a tenant, draw up the contracts, produce a detailed photographic inventory and everything you need to get you to the day of the tenant moving into the property. The tenancy will then be fully handed to you as the landlord where you will be responsible for collecting all rent, maintenance issues and all aspects of the ongoing tenancy. If you would like to discuss these options in more detail or would like to discuss if we could offer an alternate tailor made package then please contact the Lettings & Management Team in Clacton on 01255 475444 or Frinton on 01255 852555. If you are looking to Let Your property then you are dealing with the right people to make that happen. We genuinely care and that makes all the difference.